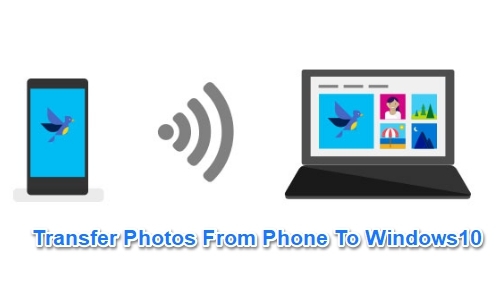 In the following tutorial, you’ll learn how to transfer photos over WiFi from your phone to PC Windows 10 desktop/laptop for free using Microsoft’s official photo sharing and companion app. Wireless transfer of photos from your mobile device to a computer saves you time and effort. On both Android phones and iPhones, photo transfer from a mobile device to computer via a data cable is still the preferred choice of many. This makes sense the number of photo files to transfer is too large for a slow wireless network to facilitate. However, with the advancement of WiFi technology in terms of speed and security, these issues no longer register as a major concern for most smartphone users these days. WiFi networks are fast enough that you can transfer photos from your phone to Windows 10 computer in a matter of seconds, or a few minutes depending on the number of files being transferred. So if you are in a situation where you don’t have a data cable, Microsoft has made it easy to transfer photos over WiFi for its Windows 10 users. 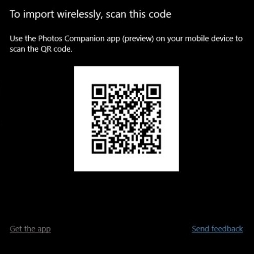 A new Photos Companion app for both iOS and Android was recently released by Microsoft. This works as a companion app for the default Photos app on Windows 10. With the help of this application, you can transfer photos from your phone to computer provided both devices are connected to the same WiFi network. Since this app is very much in experimental phase, this means it doesn’t come enabled by default and has to be turned on manually from the in-app settings. First of download the official companion app from the link shared above. Now open the Photos app on your Windows 10 PC, Laptop or Surface Pro device. At the top right, click the more options button (shown as three dots), and select Settings from the menu. 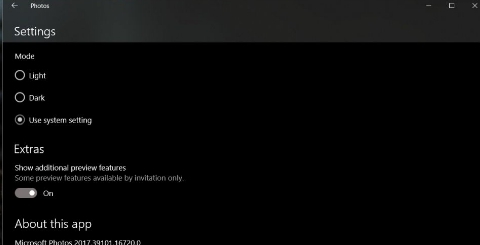 Next, on the Settings screen, scroll down to the bottom where you’ll see the Extra section. Here you need to enable the ‘Show additional preview features’ option. Now, go back to the main home screen of the Photos app. Click on the Import button. You will see a new option on the list called ‘From mobile over Wi-Fi’. Click on it. On the next screen, a QR code will show up that you need to scan. Grab your phone to scan the QR code. Make sure that the Photos Companion app is installed on your Windows 10 PC. Open the app and tap Send Photos. You will be promoted to grant permission to access your camera of mobile phone. Allow the permission to open a QR code scanner. Now scan the QR code showing on your desktop/laptop. This is a verification step to ensure that both devices are in close proximity and ready to communicate. Next, select photos from your phone’s photo camera roll/gallery app and tap send. The photos transferred are saved to the Pictures folder in the sub-folder named ‘Imported from Photos Companion’. Once done, they will appear under Albums in the Photos app. Remember that the preview feature is experimental at this stage, so the chances of bugs and errors cannot be fully discounted. If the photo transfer doesn’t finish or a few images fail to transfer, retry until they are all moved to the desired location. This feature is perfect for those who take screenshots on phones but like to edit them on computer for better detail and accuracy. Windows 10 Creators Update or later version support this feature.